Nekteck Massage Pillow Just $45.55! Down From $120! PLUS FREE Shipping! If you are looking for great gift this holiday season, how about a massager? Head over to Amazon where you can get this Nekteck Shiatsu Massage Pillow for just $45.55 down from $199.99 PLUS FREE shipping! Let your stress melt away with the help of this versatile Shiatsu Massage Pillow. Designed to target troublesome spots in your neck, lower- & upper-back and shoulders. The pillow features 8 deep-kneading Shiatsu massage heads to soothe and invigorate sore muscles. Select massage with or without heat for added comfort. Ultrasoft fabric provides a soothing surface, and an attached remote control permits easy operation. Naipo 2-in-1 Foot And Back Massager Just $46.99! PLUS FREE Shipping! Naipo has the best products for taking care of your body. I LOVE it when they send me their products to try – just like this Naipo 2-in-1 Foot AND Back Massager they sent me to tell you about! There is nothing more relaxing than ending your day with a treat. Treating yourself to a nice foot AND back massage after a long day of work or being on your feet can ease your body’s tension. While a foot AND back massage in a spa can help you relax, (and empty your wallet…), you can also do it in the comfort of your home with the Naipo 2-in-1 Foot and Back Massager. Soothe your aching back AND feet with the Naipo 2-in-1 Foot and Back Massager while improving your circulation for only $46.99 PLUS FREE shipping! This Naipo massager combines a foot and a back massager in one. It helps relieve body pain perfectly. After a day of working, use this deep kneeling massager to get your waist and foot even while your whole body feels totally relaxed. This 2-in-1 massage is a multiple use massager and you can use it as a pillow or massager at home or office. You can use it whenever you want to relax: While taking a nap, browsing the internet or watching TV. 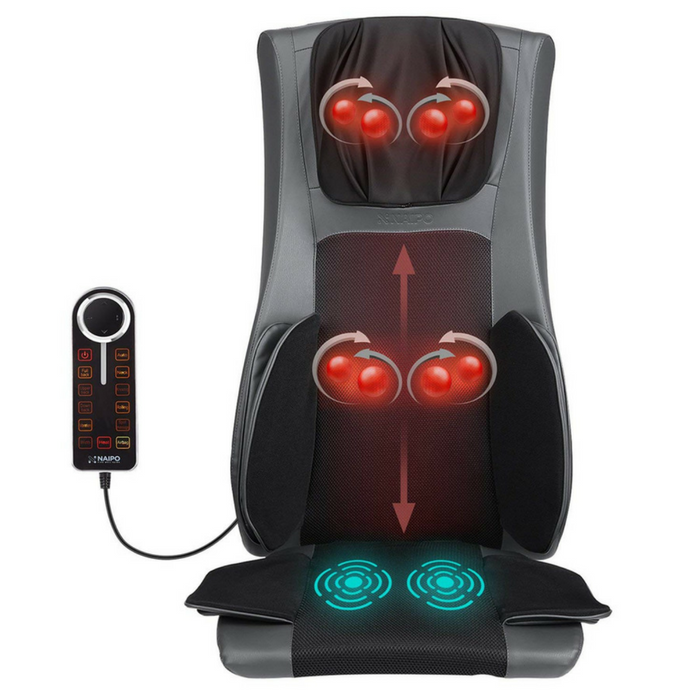 This massager delivers a Shiatsu massage and a tapping function that works effectively to help relieve pain, stress, and stiff muscles on the feet and back, improving your well-being and mental and physical rejuvenation. Features a convenient and easy-to-use corded controller which allows the control of all functions and modes without the need to bend down. The top footmuff is removable by unzipping and machine washable to maintain its tidiness and softness, promoting easy care and hygienic use of the massager. Comes with removable layers that makes it perfect for use in winter and summer. Has an exterior hood that adds extra warmth and cushion for feet. Provides soothing heat therapy that improves blood circulation and gives natural pain relief for sore muscles. Professional Massage At Home? The Naipo Neck And Back Massage Cushion Chair Is All You Need! Do you love going for a massage or getting a pedicure so you can use the massage chair? Now you can do that in the comfort of your home! Naipo sent me their wonderful massager to test out and share with you! I had the privilege of testing out the Naipo Shiatsu Back Massager Chair Seat Cushion. I’ve never been more excited to relax and de-stress while watching TV or working at my desk! This beautifully crafted Shiatsu Back Massager Chair from Naipo hits every spot as well as a professional masseuse would — without spending a fortune at a spa. Coming home after a long day of work, the only thing your body wants is to relax and reduce the tension and stress. This Naipo 2017 Shiatsu Back Massager Chair Seat Cushion targets the back, neck, and shoulders which are affected by stress and improves your blood circulation to help you sleep comfortably at night and give you a great start to your day. The Naipo 2017 Shiatsu Back Massager Chair Seat Cushion comes with a remote control and helps you customize the rolling, vibration, kneading, and intensity in the palm of your hands. All you just need to do is to place the massage seat cushion on your chair, couch or recliner, plug the AC adapter into the wall outlet, sit back, relax, and enjoy. Amazon has this Naipo Shiatsu Back Massager Chair Seat Cushion for only $229.99 right now, when you use the $30.00 coupon located below the price, PLUS FREE shipping! I will say that recently I have a pain in my thigh I can’t seem to figure out why – maybe I have started walking funny… lol anyway, I sat in the massager the other day and just used the vibration and air bags and I was SHOCKED to find that for the rest of the day that pain was gone. Before that I had trouble sleeping because it hurt when I moved. My DIL loves coming in after work when she picks up the kids and sit in it a bit to relax and unwind, too. 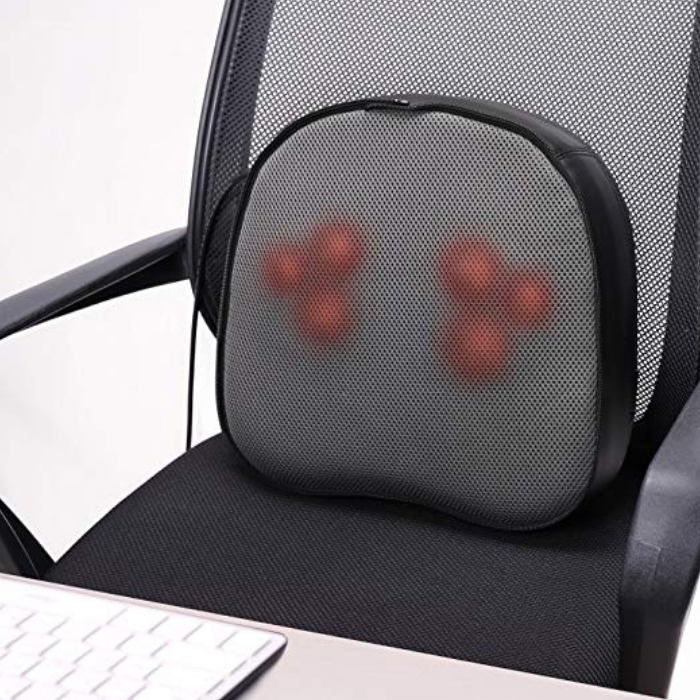 This neck and back massage cushion chair includes 8 nodes provide a deep-kneading massage. It combines neck massager, shoulder massager, back massager, thigh massager and leg massager in one, which gives you a soothing massage experience. Provided with a heating function and 3 levels of vibration intensity. It relaxes your neck and back area, enhances blood circulation and soothes aching muscles. The back and neck shiatsu nodes can be set to pinpoint a specific spot on your back and neck. Comes with multiple airbags around the hips and waist areas. This full body massage cushion inflates to apply you a compression massage. Its advanced Airbags technology provides you pressing strength to a tee. Adjustable height and width of neck massage nodes to target the exact muscles you want. You can also select shiatsu massage, which uses a circular motion and deep kneading. The massage chair is programmed with a 20-minute auto shut-off function to keep you safe. Comes with 13 airbags around the hips and waist areas to make you feel more relaxed, lighter and more agile. Handheld remote control allows you to customize your massage experience well. Has a foldable design for easy carrying and storage, suitable to turn any chair into a massage set in the office or at home. You can also enjoy more relaxed, stress-free, and pain-free evenings! With Naipo’s 2018 World Cup Relax & Watch the Match, you have the chance to win one of the Naipo massagers! 6. $20 and $10 Cash Voucher. Vote for your favorite team via Naipo’s website until July 14th!